Maybe the skill of greater than, equal to, and less than is used a lot, but having the understanding of quantities is vital for mathematical understanding. So, today my freebie reinforces K.CC.C.6 which states: Identify whether the number of objects in one group is greater than, less than, or equal to the number of objects in another group, e.g., by using matching and counting strategies. It's a game called "Who has more?" This little game is simple and hopefully your Kinder kids will love it : ). Kids roll a handleful of dice onto a game board (it might be best the game board is place in a shallow box so the dice don't fly everywhere). They record how many dice are on each character's side and they compare those values and put the correct sign (greater to, equal to, or less than). You can download it free here at TpT or free here on TN. Have a great week! 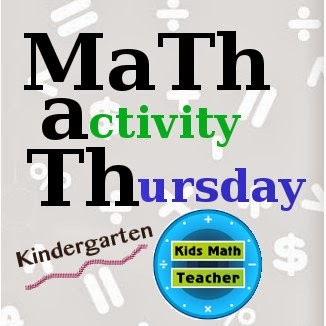 I'll see you next week when we will have MaTh activity Thursday for one more Kindergarten focus and the following week with 1st Grade for the whole month of February! Hope your kids are feeling better. Great activity!